The display on Kindle Fire HDX offers a high-resolution screen that makes for very crisp colors when you’re watching that hit movie or reading a colorful magazine (see the following figure). In-plane switching is a technology that gives you a wide viewing angle on the Kindle Fire HDX screen. The result is that if you want to share your movie with a friend sitting next to you on the couch, she’ll have no problem seeing what’s on the screen from that side angle. 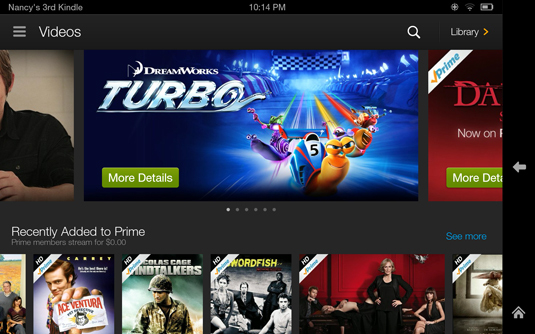 The bright display on Kindle Fire HDX makes media shine. In addition, the screen is coated with layers of gorilla glass that make it extra strong, so it should withstand most of the bumps and scratches you throw at it. Of course, you should avoid dropping your Kindle Fire HDX, exposing it to extreme temperatures, or spilling liquids on it. The User Guide also advises that if you do spill liquids, you shouldn’t heat the device in your microwave to dry it off.